While it is possible for an experienced do-it-yourself amateur to install a ceramic floor, the process is relatively time-consuming and difficult. Mistakes can also end up wasting materials and may cost you more to fix than hiring a professional would have in the first place. Substrate: The subfloor that the ceramic is being installed on is the most important element of the work. It has to be completely smooth, flat, and free of any defects. Small dips or rises in this surface can lead to pockets of air underneath the tile, which will become weak points that can crack and chip over time. Note: Some professionals charge extra for substrate preparation services. Also, the material of the subfloor cannot be prone to changes in size due to fluctuations in temperature. Because of this concrete is the most common substrate surface used for ceramic installation. However, when installing on a fresh pour of concrete, you have to wait for at least 28 days for the moisture to completely dry out of the mix. Glazed and Unglazed Tiles: The glaze refers to the glass coating which is fired onto the surface of some ceramic tiles. This is a protective layer, which ensures that the tile is impervious to stains and water damage. However, some people prefer unglazed materials as they tend to look more natural. Unglazed ceramic floors will need to be sealed periodically to protect them from stains. Terra Cotta: This is a type of ceramic made from red clay bisque which is fired at a relatively low temperature, producing a fragile tile that has a very distinct, natural appearance. Porcelain: A clay tile baked at very high temperatures, porcelain is extremely strong and durable. However it is also harder to cut, and shape, than other ceramic materials. Because it has an absorption rate less than .5%, porcelain can also be installed in some exterior locations and will be able to handle frost and freezing conditions. Important Note: Make sure that you do not end up purchasing ceramic wall tiles. These are thinner, and less durable than flooring materials because they do not have to withstand the rigors of constant foot traffic. Installation: Approximately $4 - $6 per square foot, depending on a number of factors including location and size of the job. Durability: The life cycle of a material is always pertinent when considering its cost. A well installed ceramic floor which is properly cared for can last for decades and will outlast almost any other hard tile material that you choose. Removal: At the end of its use, it will cost about $2 per square foot to remove ceramic tiles. In some cases you will be able to avoid this by installing directly over the ceramic, depending on the surface covering that you choose. Pricing Note: The cost of ceramic floor tiles has been drastically reduced in recent years due to improvements in manufacturing technologies. Today tiles can be kiln fired in minutes, as opposed to days, allowing ceramics to be produced much faster, and more efficiently. Ceramics are most commonly cut into squares of 12” X 12”, 16” X 16”, and 6” X 6” sizes. However, these can be further cut down into rectangles and triangles of nearly any sizing, though the best practice is to use evenly divisible sizes to cut down on waste. In some cases, hexagonal ceramic tiles may be available as well. Ceramic tiles are rated by the Portland Enamel Institute, which judges the durability of a tile based on a 1 (weakest) - 5 (strongest) scale. In general, a hardness rating of 3 or greater is required for any ceramic flooring, and lower level materials should only be used in wall applications. Cleaning: Warm water or regular sweeping should be enough to keep ceramic floors completely clean and sanitary. If you vacuum, then make sure that you use the soft hose attachment to prevent scratches. In the case of set in stains, a water-vinegar mix can be applied. If you do employ a detergent, make sure that it is ph balanced, so it doesn’t strip the glaze. Grout: This is the most vulnerable point in any ceramic flooring installation. Grout lines are susceptible to the penetration of dirt, liquids, and staining agents, and can be a breeding ground for harmful microorganisms, including unsightly bacteria. These issues can be prevented by applying a quality sealer to the grout immediately after installation of the floor. This will need to be reapplied periodically every year or so, as the sealer will wear down over time. You will also have to spend more time doing regular cleaning and maintenance of grout lines and may need to sand them out and replace them completely from time to time. Breaks and Cracks: When a ceramic tile is damaged the only thing that you can do is remove it and replace it. If you are there for the initial installation, you should be sure to hold on to a box or two extra of the material so that you will have matched replacement pieces on hand. If not you may be able to track down a replacement through the internet or by going to the original company. If all else fails, some companies specialize in creating a custom-made replacement tile which will match the look of the rest of your floor. The price for this usually starts at around $40 per piece, depending on the complexity, which is a relative bargain compared to removing and replacing the entire floor. High Traffic Locations: Harder ceramics and porcelain tiles are appropriate in kitchens, living rooms, hallways, and other areas that receive a large amount of foot traffic. Commercial Applications: Many retail and public institutions prefer the use of ceramic flooring over other resilient materials because it is particularly easy to clean and maintain. It is often used in place of marble and granite tiles to achieve a look of elegance without having to deal with cleaning issues that those natural materials can present. Second Story Installations: While ceramic tiles share many of the properties of natural stone, they happen to be much lighter. That makes them a more desirable and functional flooring choice for installations that are on second and upper-story floors. This is especially true in older homes, where the joists and reinforcements in the building may not be as reliable. What Should You Know About Ceramic Basement Floors? How Do You Choose Rubber Flooring for Home Use? 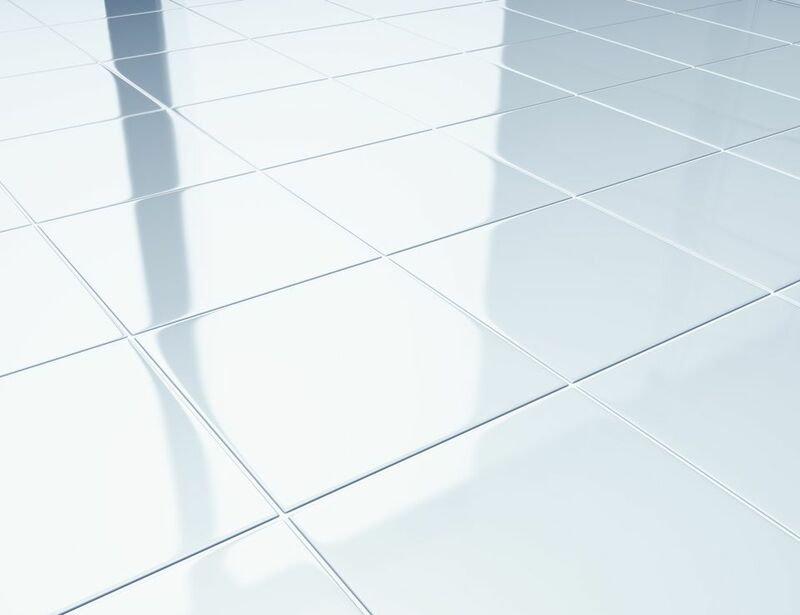 What Are the Benefits and Drawbacks of Mosaic Glass Flooring?